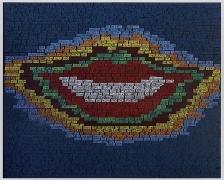 Much like the subject of his upcoming solo @ Freight+Volume, SMILE, Erik den Breejen’s new series of paintings is a long-awaited masterpiece. 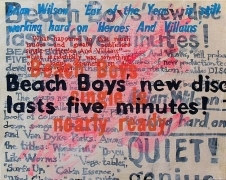 Following in the distinguished and venerable tradition of illustrated words, from the Gutenberg Bible through medieval illuminated manuscripts, up to Holzer, Weiner and Kruger’s conceptual billboards, den Breejen’s fascination with text has met a worthy challenge—illustrating the entire lyrics to the recently re-released Beach Boy’s magnum opus, SMILE. All these years, in short, I had assumed that in art, if nowhere else, seeing is believing. Well—how very shortsighted! Now, at last, on April 28, 1974, I could see. I had gotten it backward all along. Not "seeing is believing," you ninny, but "believing is seeing," for Modern Art has become completely literary: the paintings and other works exist only to illustrate the text. 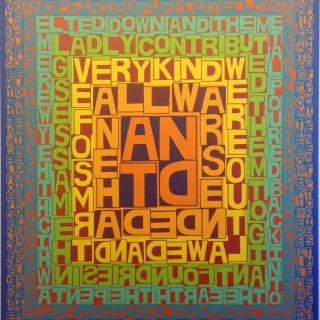 But in fact den Breejen’s work does much more than just illustrate text or illuminate theory—in many ways he brings the words back to life. 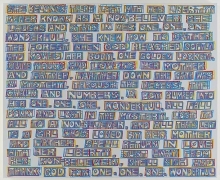 The lyrics, written by Van Dyke Parks, are painted in a grid covering the entire surface. 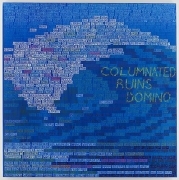 His paintings are from the gut—bold, intuitive and visceral in conveying the emotional power and effect of music. 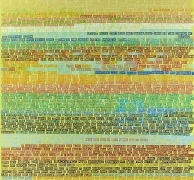 Stanzas change color, are layered in resonant hues to produce a bodily, hallucinatory impression on the viewer. One actually feels the chords and melodies emanate from a work like “Surf's Up” or “Smile II,” for example, through the shifts in color, font and style den Breejen employs. 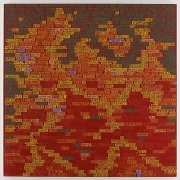 Like Christian Marclay, the artist successfully bridges the crossover between music and art in his work, and in “Smile” den Breejen has also chosen to tackle a theme he’s been obsessed with for years: how an artist (or musician, writer, dancer, filmmaker) can sometimes fly too close to the sun in creating a major work and suffer the consequences. 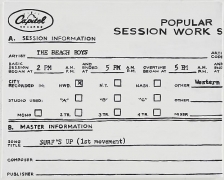 There is a dark side to the Beach Boys’ career, even though they were arguably one of the most popular bands of their time, producing songs which are just as warm, uplifting and California surf-invoking now as when they were written. 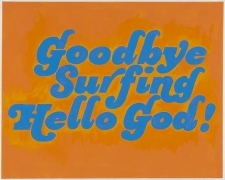 "Good Vibrations" broke new ground with its psychedelic overtones and by demonstrating the band’s ability to use the recording studio as an instrument. But many feel the band never lived up to its promise, and remained stuck in teenybopper cult status, unlike their peers from that era—Rolling Stones, Led Zeppelin or Beatles. Sergeant Pepper’s Lonely Heart Club Band was released shortly after the Beach Boys’ single "Good Vibrations," and swept the world charts; Brian Wilson, already sinking into the quagmire of drug-induced paranoia and depression, never quite recovered from that displacement. Years later in 2004, he produced his own version of Smile, devoid of any trace of his band members, but the real Smile which true devotees of the Beach Boys have been waiting for these past fifty years is actually these previously unreleased recording sessions, which den Breejen resurrects and interprets anew, in a brilliant and indelible way. Have you listened as they play? And the children know the way. Erik den Breejen was born in Berkeley, California in 1976. He studied art and electronic music at UC Santa Cruz before transferring to the California College of the Arts, where he received a BFA in painting in 1999. Den Breejen moved to New York in 2000, receiving an MFA in painting from Cornell University in 2006. Musical projects have included Import, Acid Canyon, and Big Game. He lives and works in Brooklyn, NY. This is his second exhibition at Freight+Volume. I make it my goal to be intuitive and to let the work guide me. In my animations one of my main explorations is space, I am interested in the idea of space being changeable, or that the world of my videos doesn’t need to be logical. I want to plow through space in a physical way, pushing forward into it with tactile energy. I want to go mucking from side to side with gooey, soupy paint or chunks of cut paper and objects. I like to make it physical so the viewer can feel it in a visceral way—not slick or heavily produced. Five Kinds of Light is a recent work by an artist who received his BFA from the California College of Arts and Crafts, and his MFA from Hunter College. He is the recipient of two residencies, the Marie Walsh Sharpe and the Fine Arts Work Center in Provincetown, and has had solo shows at the UCLA Hammer, the DIA NYC, and the New Galerie in Paris. Johnson currently divides his time between New York and London. 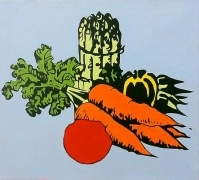 Please join us for an artists’ reception on Saturday, December 10th, from 6-8 pm. For more information please contact Nick Lawrence @ 212-691-7700 or nick@freightandvolume.com.